Another nineteen mysteries featuring Agatha Christie's Belgian super sleuth (David Suchet) are coming to Blu-ray in January. 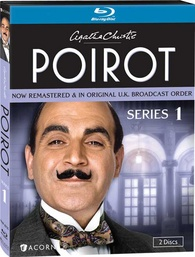 In an early announcement to retailers, Acorn Media has just revealed 'Poirot: Series 1' and 'Poirot: Series 2' for Blu-ray on January 31. Series 1 will include ten episodes: The Adventure of the Clapham Cook, Murder in the Mews, The Adventure of Johnnie Waverly, Four and Twenty Blackbirds, The Third Floor Flat, Triangle at Rhodes, Problem at Sea, The Incredible Theft, The King of Clubs, and The Dream. There will be nine episodes included with Series 2: Peril at End House, The Veiled Lady, The Lost Mine, The Cornish Mystery, The Disappearance of Mr. Davenheim, Double Sin, The Adventure of the Cheap Flat, The Kidnapped Prime Minister, and The Adventure of the Western Star. Both releases will be a 2-disc set and will have a Dolby Digital 2.0 soundtrack, but supplements haven't been detailed yet.. Suggested list price for each Blu-ray set is $49.99. You can find the latest specs for 'Poirot: Series 1' and 'Poirot: Series 2' linked from our Blu-ray Release Schedule, where they're indexed under January 31.